The move to a larger building is meant to accommodate "clients' choice" shopping. Several tons of food, 160 volunteers and a new 12,000-square-foot building where low-income clients can shop with dignity in a grocery store setting. Friends in Need Food Shelf in south Washington County has become one of the latest metro-area food shelves to adopt the “clients’ choice” model, where they make their own decisions in aisles stocked with everything from soup to nuts. “That’s what the buzz in the food shelf world is, that it treats them with more respect,” said Michelle Rageth, the Friends in Need executive director. The new food shelf building opened in May in the small commercial district of St. Paul Park, not far from the old building where Friends in Need did business for 21 years. Funding included $250,000 from Western Refining for a down payment on the $1.4 million project, and several businesses donated labor and materials. Every Tuesday and Wednesday, 160 families visit the food shelf to shop for groceries donated from several sources, including Second Harvest, major supermarkets, community gardens in Newport and St. Paul Park and Guardian Angels Catholic Church in Oakdale. Volunteers stock shelves and manage the warehouse and freezer at the back of the building. “Our fresh produce is really a big thing for us,” Rageth said. Clients come to shop every other week, Rageth said, because the organization wants to ensure that they get enough food to last an entire month. Some of them are jobless; many others, the working poor. Some are middle-class families experiencing a sudden loss of employment or other life-altering events. The spacious building includes offices where clients can receive assistance with other needs, such as MNsure, foreclosures and home goods, and those needing transportation can get a ride as well. Friends of Need also is looking for a company to donate snowplowing this winter. Once clients enter the grocery aisles, they look for colored dots posted above each section that tell how much of one item they can take. Families, for example, will get more. Volunteers are available to help people with disabilities who want it. ​The grocery store approach is an emerging trend among food shelves statewide, said Jill Westfall of Hunger Solutions Minnesota. “Since food shelves operate independently, we sometimes don’t know they’ve changed to a client choice/grocery store model unless they tell us,” she said. Through August, the food shelf served 17,325 people, including 165 new families. In 2015, the total number served was 29,362, including 313 new families. That’s declined from peak demand four years ago, which Rageth attributes to many more available post-recession jobs. To qualify at Friends in Need, clients must already receive some type of financial assistance or fall within 200 percent of federal poverty guidelines, making it “very easy to qualify,” Rageth said. Clients also must live in St. Paul Park, Cottage Grove, Newport or Grey Cloud Island. The food shelf serves residents of Cottage Grove, Newport, St. Paul Park and Grey Cloud Island. Prospective clients are asked to make appointments on Mondays, from noon to 3 p.m., at 651-458-0730. How to help: Money is the preferred donation because “we can make it stretch 10 times more,” said Michelle Rageth, executive director. Volunteers are always needed, she said. Coming up: Oktoberfest, a Friends in Need fundraiser, is scheduled for noon to 4 p.m. Oct. 16 at Historic Hope Glen Farm, 10276 E. Point Douglas Road S., Cottage Grove. Tickets are $10 for adults, $5 for children ages 4-12, and free for 3 and younger. The Holiday Train event in Cottage Grove on Dec. 9 also benefits Friends in Need. ​More information: Call 651-458-1787 or visit www.finfood.org. 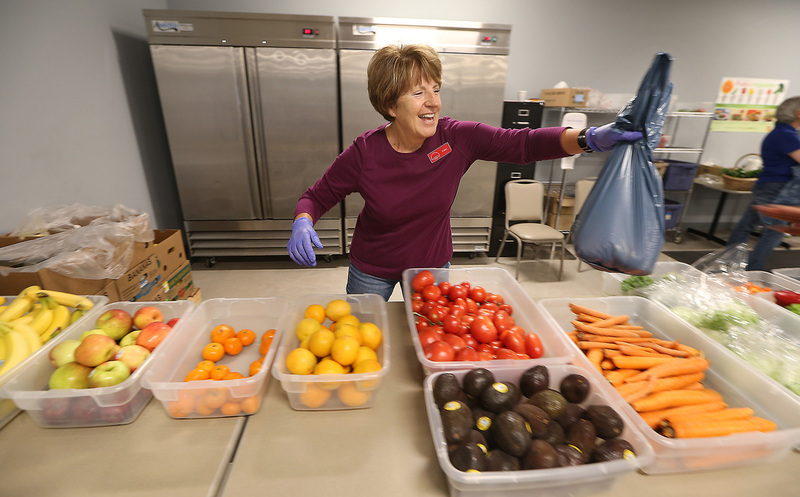 Friends In Need volunteer Nancy Reckinger, happily packed up fruit and vegetables for a client at the food shelf in St. Paul Park. Michelle Rageth has been the executive director of the Friends in Need food shelf in St. Paul Park for 16 years. As the only full-time employee, she relies on volunteers to help distribute fresh produce, dairy, meat, and other groceries as well as toiletries and information about social services throughout the year. For those interested in contributing, she notes that cash donations to food banks result in obtaining up to 10 times as much food as canned-food drives. So many people who lost jobs in the recent recession never thought they would have to use a food shelf. They come in and say, ‘We’ve always donated to you, we certainly don’t want to have to be here.’ ​"